The city of Malda lies on the map of India as a town separating India from Bangladesh. The historic place was once the ruling seat of Muslim rulers of India, who have left a prominent mark on its architecture, culture and way of living. Malda still preserves the heritage despite the winds of modernity that blew later, converting it to an agriculturally commercial place. Commercially, Malda in known for its extensive jute cultivation and its special breed of mangoes called Fazil. The city has a unique blend of folk culture called Gombhira that represents the sorrow and joy of daily life. The administrative sector of Malda is called English Bazaar, which was once the capital of Bengal. Post monsoon and during winters, October to March, is the best time to visit Malda. The weather is beautiful with green flora dominating the city that gives it a scenic view. Summers in Malda are hot and sultry and a visit during this time should be well planned. Monsoons bring heavy rains in Malda and the area is prone to frequent floods and thus, a visit during this time should be avoided. Malda is located at a distance of 360 km from the city of Kolkata. There are two mains routes to reach Malda. Route 1: Kolkata - Bardhaman - Murshidabad - Ramkantapur - Malda via NH12 and Badshahi Road. The second route is approximately 490 km and should be avoided. Route 1 is the preferred route as it encompasses the rural culture of Bengal and gives a glimpse into the village life and ancient heritage of the state, while providing scenic views all along the way. 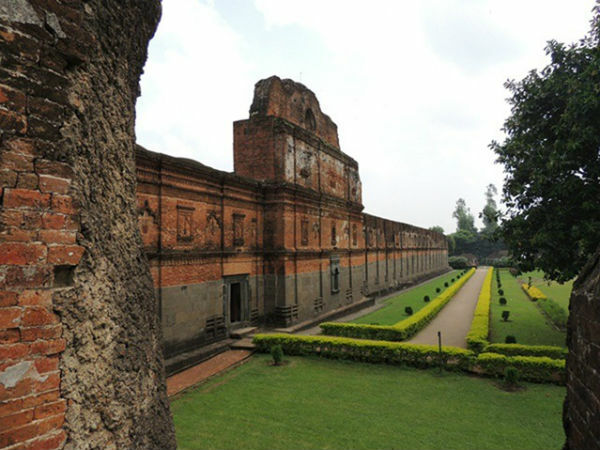 The ancient city and an important seat of power in medieval Bengal, Bardhaman still preserves the pages of its rich heritage. The 108 Shiva Temple flaunts the unique terracotta architecture found nowhere else. The Deul Park located in close proximity to the highway is a well-developed eco-park with a serene ambience. The Ramnabagan Wildlife Sanctuary hosts varied species of flora and fauna that connect visitors to nature. Murshidabad lies at a distance of 136 km from Bardhaman. As such Murshidabad is a large district and it is quite difficult to cover all its attractions in a short span of time, yet it is advised to explore the place to the maximum possible extent. The city is known for its exquisite palaces and mosques. The Hazarduari Palace is located in the campus of Kila Nizamat and was built in 1837. The palace has grand entry gates and lofty minarets that display the mark of perfection. The palace holds lavish exquisite paintings and displays artefacts for the public. The Katra Masjid and the tomb of Murshid Quli Khan are located on the eastern boundary of the city. It is a recognised centre of Islamic teaching and has a large courtyard that is surrounded by pleasant greenery from all sides. Farakka is located at a distance of 104 km from Murshidabad. The Farakka Barrage is one of the largest dams of India. The dam diverts the water from the Ganges. It is about 2000 metres long and provides a picturesque view of the Ganges river. Riding along the barrage is of utmost fun as the view of sprawling greenery on one side and that of a mighty river on the other is powerful enough to thrill travellers. 80 km ahead of Farakka lies Malda. On reaching Malda, the rural culture of Bengal is well reflected in the form of thatched rooftops, extensive jute and paddy fields, large mango plantations and the distinct dialect of the local people. Malda city has been well developed in recent times and it is very easy to find hotels and restaurants in English Bazaar. Ramkeli is a spiritual place known as the temporary home of the great saint, Sri Chaitanya. The Tarnal and Kadamba trees stand still as a testimony to the fact that it was a site for Sri Chaitanya's mediations. There is small temple under this tree that contains his footprints and the eight tanks flanking the temple are visited by devotees all round the year. It is a Muslim monument built in 1425. The red brick structure and terracotta work is simply magnificent, highlighting the 21-metre-long structure. It has four corners topped with a 5-storey towers. The main gateway to the fort is enclosed by embankments. The ruins of an old fort are also seen within the premises. The high walls have mounts where cannons used to be mounted and are therefore known as Salaami Darwaza. The minar is located near Dakhil Darwaza and was built by Sultan Saifuddin Feroz in 1485. It has a striking resemblance to Qutub Minar. The 26-metre-high tower has a spiral flight of 84 steps and is built in the Tughlaq style of architecture. The walls have intricate carvings in terracotta and the landmark is known as Chiragdan. Gour is situated at a distance of 16 km from Malda town. It was the seat of King Shashanka in the 7th century and the capital of Bengal then. There are numerous sites to be explored in Gour, primarily Boro Sona Mosque, Chamkati Masjid, Luko Churi Gate, Kadam Rasul Mosque, where the footprints of Hazrat Muhammad are placed, and the Gumti Darwaza, which is known for its brilliant and colourful artwork in terracotta.